When Sasha was eight years old, she arrived in the United States from war-torn Sierra Leone to be reunited with her mother, who had left her with a sister when Sasha was just six months old. The transition was not easy. Sasha, whose last name is withheld to protect her privacy, had lived with family in Sierra Leone up until age four. After that, different families took her in. Reconnecting with her mother after so many changes brought its own challenges. Moving to the U.S. did not mean an end to the instability that had characterized her earlier years. The family moved 12 times, as Sasha recalls, first living in Pennsylvania, then Texas, and continuously moving from then on. Sometimes, Sasha’s mother could not afford to pay rent, and the family was homeless. Speaking with Diverse following a briefing on youth homelessness organized by a coalition of organizations including Civic Enterprises, SchoolHouse Connection, America’s College Promise and the Institute for Children, Poverty and Homelessness on Capitol Hill on Monday, Sasha discussed some of the challenges she overcame on her path to a college degree. While her mother was out of the home working to provide for Sasha and her siblings, as the eldest, Sasha stepped in to take care of her younger siblings. At times, school fell by the wayside amid all her familial responsibilities. Her living situation in Sierra Leone had also precluded her from participating in any form of early childhood education. Despite many obstacles, Sasha nevertheless made her mark in school. “AVID was the first program that made me believe in myself,” Sasha said, referring to Advancement Via Individual Determination, a nationwide college-readiness program housed in schools across the nation. “The teachers, they pushed me,” she said, encouraging her to take higher level classes than she would have believed possible on her own. When Sasha took the ACT, she was elated to score a 29. She could hardly believe that despite missing out on an education during her earliest formative years, she was able to place in the 93rd percentile of students nationwide. Her teachers helped her fill out scholarship applications and apply to college. Today, Sasha is majoring in nursing at the Delaware County Community College (DCCC) in Pennsylvania, funding her education through multiple scholarships. Sasha’s achievements in the face of massive obstacles are remarkable. Yet she is far from alone. 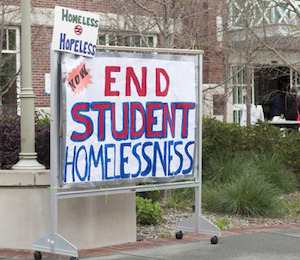 More than 1.3 million K-12 students were homeless in the 2013-2014 academic year. Even though many students experience homelessness, advocates say that their experiences and educational outcomes are not well understood. Starting this school year, schools will be required to report on the education outcomes of homeless students through the Every Student Succeeds Act (ESSA). Advocates hope that the data will shed light on a vulnerable and often invisible population. Even once they graduate from high school, financial challenges often follow homeless students to college. The numbers of homeless and financially challenged college students are on the rise, precipitating more schools to open food pantries to assist struggling students. A recent report from the Wisconsin HOPE lab found that one-third of community college students are hungry and 14 percent are homeless. Barbara Duffield, executive director of SchoolHouse Connection, said that there a number of key legislative areas that could have a significant impact on postsecondary attainment among homeless students. Too often, homeless students struggle to meet their basic needs due to financial instability — which in turn gets in the way of their ability to succeed academically. Advocates say that removing certain barriers in financial aid would help streamline the application process and broaden access for homeless students and students who have experienced the foster care system. Currently, students under the age of 24 are considered to be dependents and as a result must list their parental income information when filing out the FAFSA, which they must complete in order to be eligible for federal student aid and loans. Students whose parents are unwilling or unable to provide that information or sign off on the FAFSA have little recourse, unless they can prove that their status as an “unaccompanied homeless youth” independent from their parents. They then must verify their status each subsequent year, a process that can create a significant burden for homeless students. Colleges and universities can also take concrete steps to better assist their students who are homeless, Duffield added. They can help them find places to stay during academic breaks — either by opening up campus housing or connecting them with alternative affordable housing options. Having a single point of contact for foster youth and homeless students on college campuses would also go a long way to improving outcomes, as already is the practice in some states, such as North Carolina, Colorado, Michigan and New Hampshire, Duffield added. “Having a single point of contact, not only does it benefit students in terms of helping them navigate the system, but it also helps raise the visibility of this essentially invisible population,” she said. He said that all his hard work is not just for his benefit: he wants to pave the way for his five younger brothers and sisters. “It feels like you’re a lead climber on a mountain, and if you slip, everyone else slips with you,” he said.